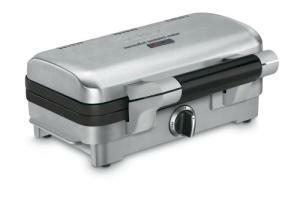 This fresh idea by Cuisinart accommodates thicker sandwiches which may defeat lesser machines. Armed with extra large plates formed to hold extra deep pockets, the device can completely enclose the sandwich for better heat transfer, unlike some panini press style units. The cross cut indentations help to brown the ingredients at the open edge of the sandwich. People are ingenious when it comes to thinking of new ways to use a device. I've heard that some use their machine to make hash browns with crispy exteriors. It is possible to make homemade desserts like small pies in the pockets as well, skipping the fat of deep frying them. This unit has several indicator lights to let you know when the machine is ready to cook and when your sandwich is ready to eat. There are also several convenient features present in the machine, such as protective rubber feet, cord storage and a lid lock so that it can be stored upright. There appear to be fewer places for food to become trapped and impossible to remove than are usually found in such machines. The nonstick cooking plates require no more than a quick wipe down once the food is ready. They can also be removed for washing in the dishwasher. Push button plate removal makes this process simple and Cuisinart seems to have a good design for their plate locking system, keeping them solidly set. Just when I thought there was nothing new to come, I believe I have found an overall improvement on the hot sandwich press.